Warren Buffett, the billionaire investor and philanthropist who lent his name to President Barack Obama’s proposal to raise the tax rate on the wealthy, will host a fundraiser for the president on Tuesday at the Omaha Hilton. First Lady Michelle Obama is scheduled to attend, as is Susie Buffett, Warren’s daughter and a prominent philanthropist. A Obama campaign official told Mother Jones that approximately 200 people are slated to attend the event. Despite Buffett’s standing as one of the world’s richest persons, the event is not for only the top 1-percenters. Tickets start at $250 a person. The money raised will go to the Obama Victory Fund, the president’s main re-election war chest. 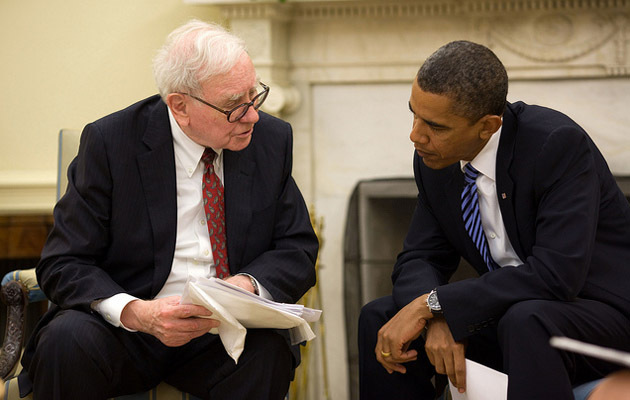 This isn’t the first time Warren Buffett is participating in Obama’s 2012 fundraising cause. Last September, the “Oracle of Omaha” headlined an Obama fundraiser at the Four Seasons restaurant in midtown Manhattan. To be a “host” for that event—billed as an “economic forum” with Buffett and Austan Goolsbee, the former chair of Obama’s Council of Economic Advisers—a donor had to part with $38,500. To get in as a non-host, contributors had to pony up at least $10,000 a head. The most generous donors enjoyed a “VIP reception” with Buffett himself. Obama has pushed the Buffett Rule—which was blocked by Senate Republicans this month—as a way to raise revenues for government to help tame the deficit and to promote tax fairness. Now the Obama campaign is using Buffett to raise some revenue of its own.